With the Ram 2500, you can choose the available Uconnect 4C NAV infotainment system. This infotainment system lets you easily connect to music and apps on your smartphone because it supports Apple CarPlay and Android Auto. It is paired with a vibrant 8.4-inch touchscreen, which is the largest in its class. It also features a number of safety and security features such as SOS Call and Vehicle Finder. 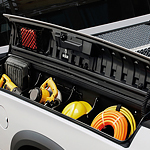 If you go with the Crew Cab, then you get a standard in-floor storage unit that makes it easy to transport your essentials. The available Ram Work Grade vinyl seating is durable and easy to clean, and the available seven-inch full-color information display comes with a speedometer, tachometer, fuel gauge, and more.